Jack Frost and his goblins have stolen the Princess Fairies’ magical tiaras, and now special occasions everywhere are going very wrong! Rachel and Kirsty must help Lizzie the Sweet Treats Fairy to get her tiara back – before the goblins cause chaos in the kitchens and ruin a royal tea party! I liked Lizzie the sweet treats fairy. The main characters, Rachel Walker and Kirsty Tate are excited about having a tea party at the Golden Palace. But they can not have fun until they find Lizzie’s magic tiara. Fortunately, Rachel and Kirsty offer to help. I recommend this book to everyone who likes fairies! I wish I could be like Lizzie, Really Good! 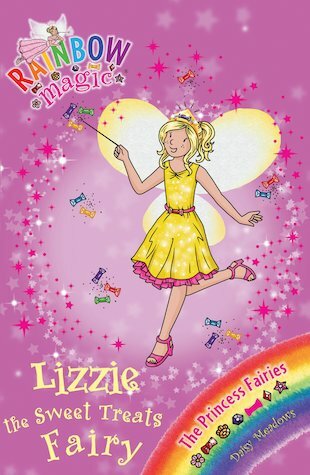 Lizzie is a very nice fairy. If it wasn’t for my BFF Karl Johnston I probably would not have raed this.